B's Beauty and Books: One Ride (The Hellions Ride Series) Cover Reveal!!!! 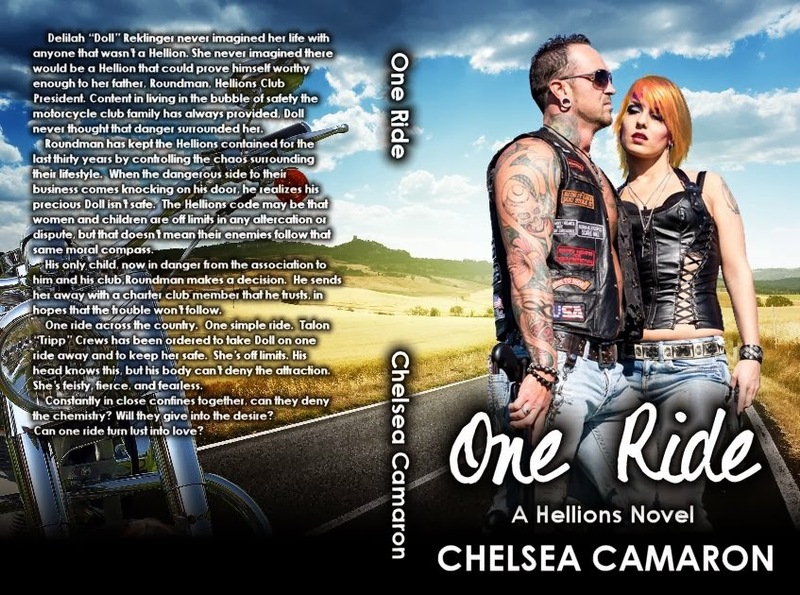 One Ride (The Hellions Ride Series) Cover Reveal!!!! Delilah “Doll” Reklinger never imagined her life with anyone that wasn’t a Hellion. She never imagined a Hellion would come along and prove himself worthy enough to her father, Roundman, Hellions Club President. Content in living in the bubble of safety the motorcycle club family has always provided, Doll never thought that danger surrounded her. His only child, now in danger from the association to him and his club, Roundman makes a decision. He sends her away to a charter club, in hopes that the trouble won’t follow. One ride across the country. One simple ride. Talon “Tripp” Crews has been ordered to take Doll on one ride away and to keep her safe. She’s off limits, his head knows this, but his body can’t deny the sparks between them. She’s feisty, fierce, and fearless. Constantly in close confines together, can they deny the chemistry? Will they give into the attraction between them? Can one ride turn lust into love?